The client's B2B quality assurance application had been built by engineers (with out a UX/UI on the project) who essentially built the database first and then created a view for each table in the database. The user experience was sub par and there was no user flow to speak of. The company and their clients had been "making it work" for a couple of years before I was brought on board. After a two week audit examining every nook and cranny of the program I recommended a complete overhaul of the organizational structure, site map, menu system, language, user flows, user interface, and visual design. The primary goal was to organize the menu structure into logical task-based groupings. The secondary goal was to flatten the menu structure as much as possible. During the evaluation phase of the project, I often found myself asking the client "what is 'x'?" and they would reply "oh that's actually 'y' but we call it 'x'". Eliminating as much jargon and proprietary language as possible removed an additional layer of learning previously required of the user. Now with task-based menu groupings, I opted for a menu flattening tabbed panel for each root menu item. 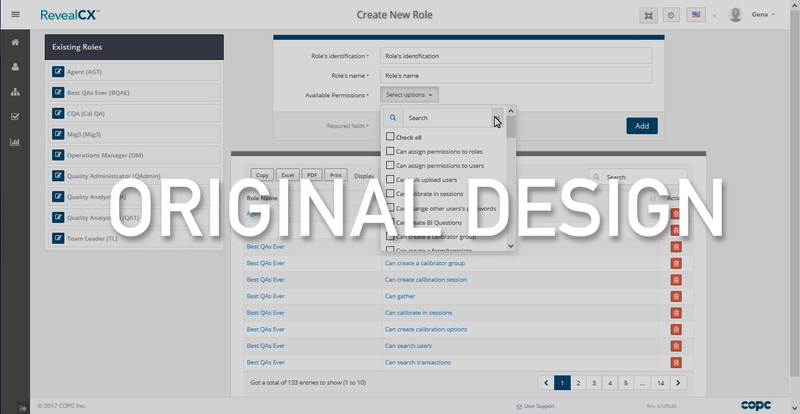 This choice created an interface that allows the user to see the options available and switch rapidly between them when performing multi-step tasks. 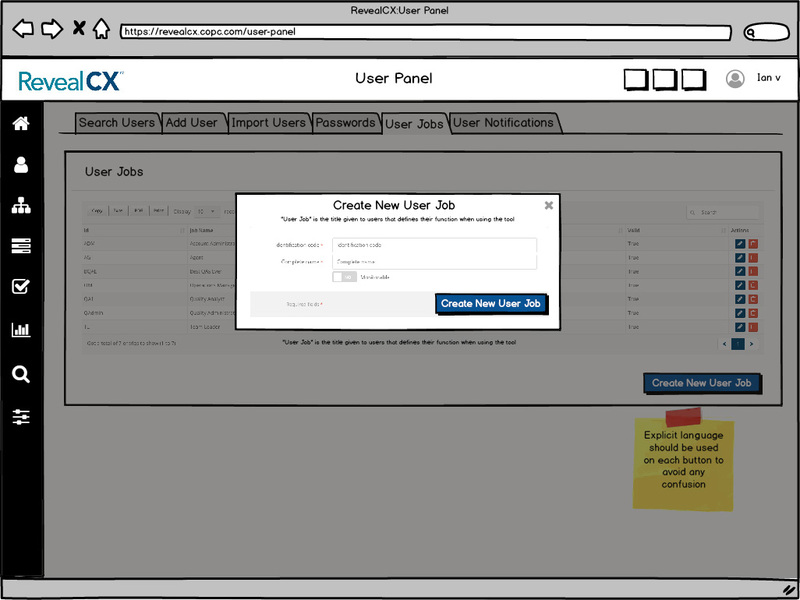 While modals are not best-practice in a mobile context, Reveal CX is a B2B desktop-only application, so I proposed pushing data forms into modals that would only show when called on by the user. From a visual standpoint this cleaned up the interface considerably and tucked action items into clearly marked locations. The existing user experience was choppy, user paths through the application were almost non-existent. 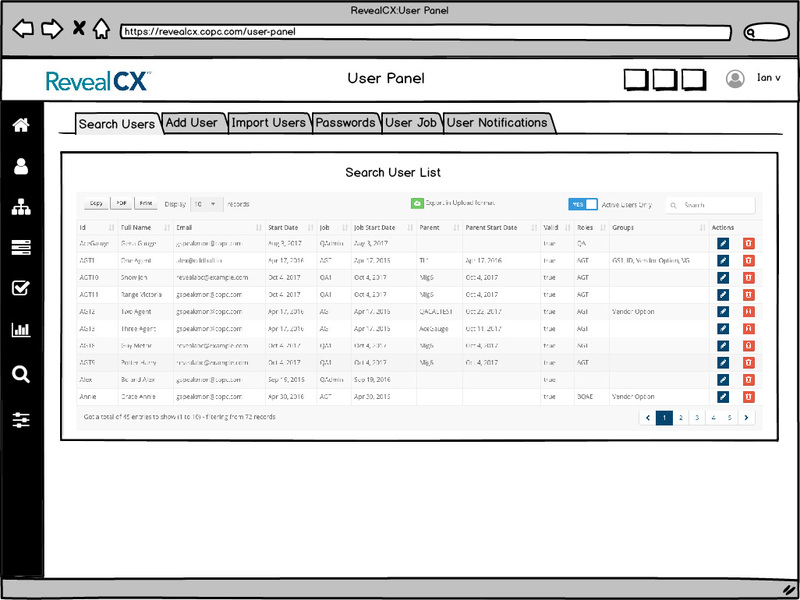 The next task was to evaluate the different types of users and develop task-based flows that streamlined and daisy-chained each user types tasks in the application. Adding Likert evaluations to the application required developing an interface and process for building weighted surveys who's functionality was best communicated with animations built in Principle. 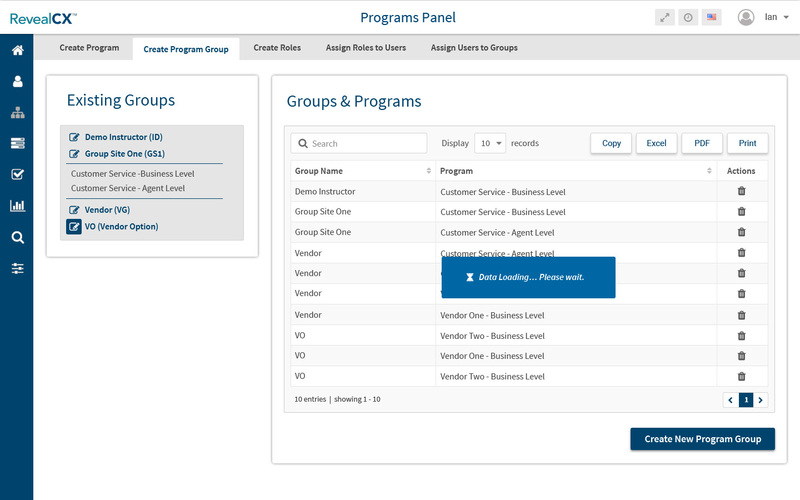 This was the "greenfield" part of the project as the previous dashboard only had user notifications. The goal was to give each of the five user types an "at-a-glance" status report and let them know what, if anything, needed their attention. The client had a directive from their customers to incorporate Likert style surveys as an option into the quality control process in the program.